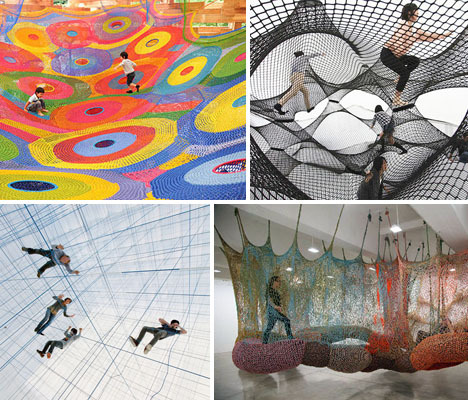 Miles of yarn and string stretch across inflatable structures, galleries and outdoor environments in these crocheted and knotted art installations, offering massive interactive playgrounds that invite people to climb, bounce and lounge. 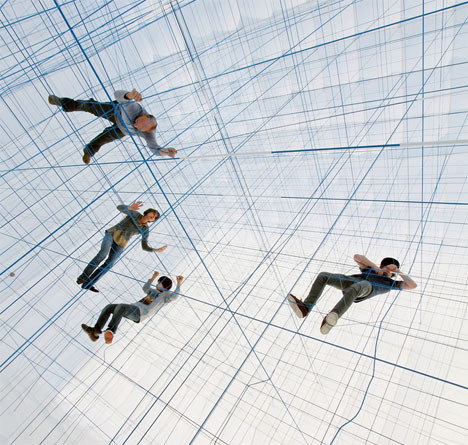 String is used as both an art medium and a functional, supportive structure in projects ranging from vast playscapes for children to a public NYC installation made of 1.4 million feet of hand-knotted rope. 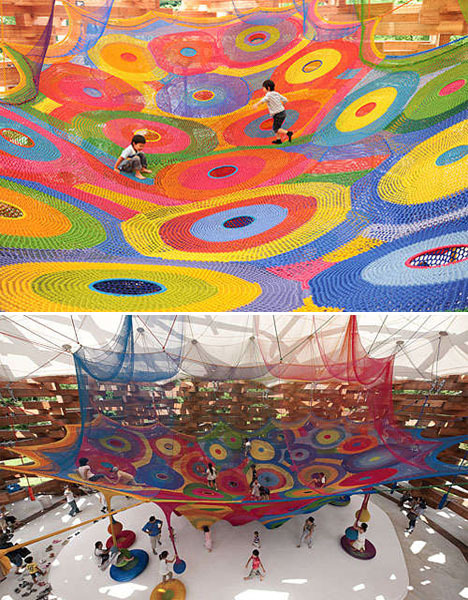 Perhaps the most vast and complex crocheted works ever created, Toshiko Horiuchi MacAdam’s colorful installations are literal playgrounds for kids and adults, installed in parks and playgrounds. The artist starts her design process by creating a wooden scale model of the space where the net will be installed, and thence rockets the piece in fine cotton thread. That design is then adapted to full scale with yarn. ‘Rainbow Net,’ her most famous piece, took three years to complete and is located at the children’s area of the Takino Suzuran Hillside National Park in Sapporo, Japan. 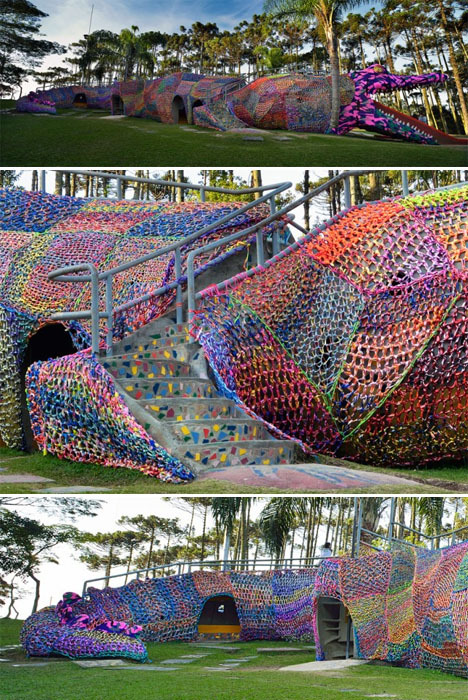 An alligator the size of a particularly massive dinosaur is covered in colorful crocheted yarn in ‘Crocheted Jacaré,’ a piece in Brazil by Brooklyn-based artist Olek. The alligator was already a part of the playground, Olek simply created some temporary clothes for it that made it stand out even more. Transparent net hung over a four-story drop offers a rather frightening play experience for anyone with the slightest fear of heights. 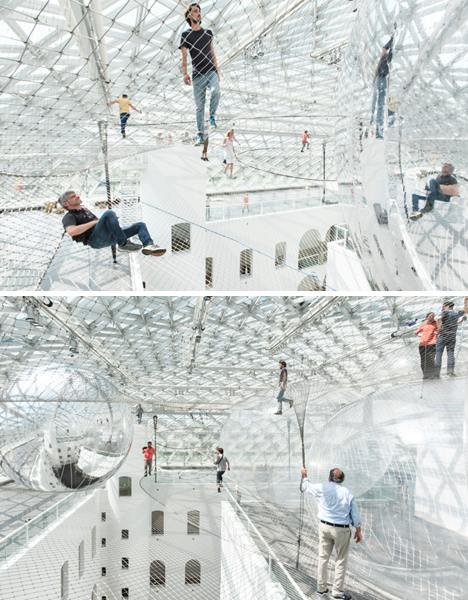 Artist Tomás Saraceno created the 2500-square-meter installation at the Kunstammlung Nordrhein-Westfalen museum in Dusseldorf, Germany, inviting visitors to walk out onto the cloud-like nets amidst mirrored spheres. 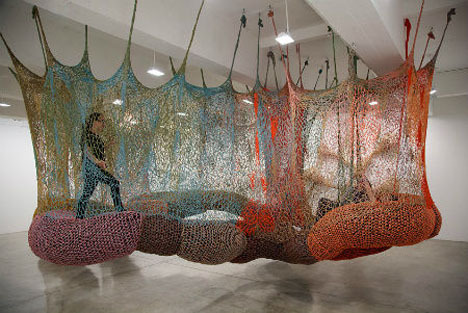 Brazilian artist Ernesto Neto creates massive crochet installations reminiscent of the playgrounds by Horiuchi MacAdam, but in more muted tones. 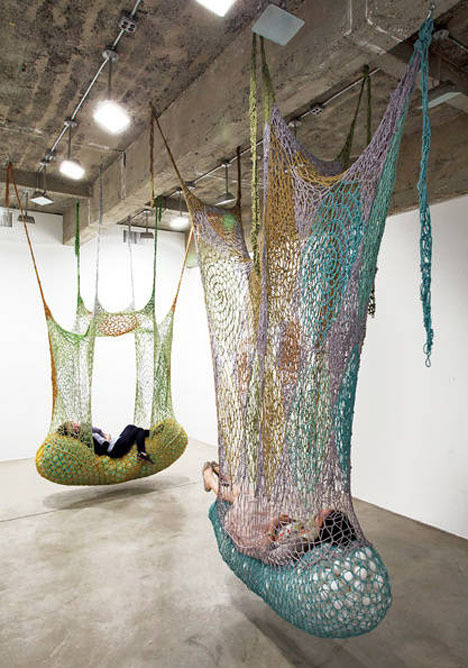 Strung from gallery ceilings, these strange little ‘nests’ offer an inhabitable space that can be either playful or quiet and comforting. Larger pieces encourage running and jumping, while the smaller ones are cocoon-like relaxation spaces.